This swanky shelving and storage system is as cool as they come; it greets everyone with a hi-five. The system is comprised of streamlined modular components: an open unit, a cabinet with a scrolling door, a sleek metal base and a wooden top that unites the units with a single surface. If no base is required, the units can be mounted directly to the wall. 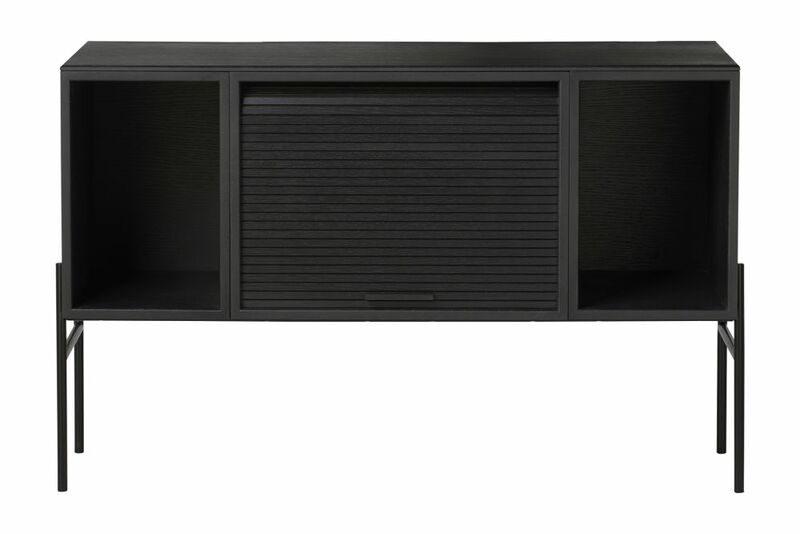 The cabinet is designed to hold equipment such as receivers, amps and multimedia players. Its scrolling door closes to conceal the contents, hiding the electronics behind a flexible wooden screen. The open unit is sized to accommodate old-school vinyl LPs but can store music and television media too. The units are available in a smoked oak veneer, black painted oak veneer and light-coloured oiled oak veneer. Contemporary in expression and practical in scope, Hifive can provide storage for a range of items.